Intense shelling and aerial assaults that claimed hundreds of lives over the weekend continued in the Gaza Strip on Monday, pushing the number of Palestinians killed by Israel's "Operation Protective Edge" beyond 500 people, with many thousands wounded, since it began on July 8. In the Gaza City suburb of Shuja'iyya on Sunday, more than 120 Palestinians -- at least 40 of whom where women and children -- were killed during intense and reportedly "indiscriminate" bombing by Israeli forces. The Ma'an News Agency reports that overall, 150 Palestinians were killed across the territory on Sunday. "It was a night of horror," one 50 year-old Palestinian from the city of Beit Hanoun in northern Gaza told Reuters. According to the New York Times on Monday, "Israel has lost 18 soldiers so far, as well as two citizens killed by rocket and mortar fire." Late on Sunday, the UN Security Council held an emergency meeting over the crisis in Gaza and demanded all parties agree to an immediate cease fire. The council, however, did not pick up an official resolution offered by Jordan which put forth stronger language condemning the violence against civilians in Gaza and called for a lifting of the siege that prevents people from leaving the enclave that has now become an open battlefield. 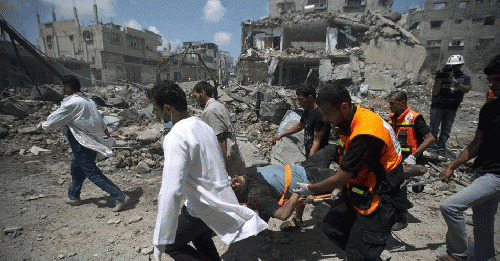 In a statement, the France-based medical relief agency Doctors Without Borders/MSF called on Israel to immediately stop bombing the civilian population trapped in the sealed-off Gaza strip and to respect the safety of medical workers and health facilities working there. "Shelling and air strikes are not only intense but are also unpredictable, which makes it very difficult for MSF and other medical workers to move and provide much needed emergency care," said Nicolas Palarus, MSF field coordinator in Gaza. "While official claims that the objective of the ground offensive is to destroy tunnels into Israel," Palarus continued, "what we see on the ground is that bombing is indiscriminate and that those who die are civilians." UN Chief Ban Ki-Moon, speaking in Doha on Sunday, made his strongest comments yet on Israel's military assault, calling for an end to the campaign that has now killed hundreds of civilians and wounded thousands, including a huge numbers of children. "I condemn this atrocious action," Ban said. "Israel must exercise maximum restraint and do far more to protect civilians." Both U.S. Secretary of State John Kerry and President Barack Obama have also backed the latest calls for a cease fire and expressed "concern" for the increasing numbers of civilian casualties, but continued to stop short of condemning Israeli's aggressive tactics. In a call with Israel Prime Minister Benjamin Netanyahu on Sunday, according to the White House, Obama raised "serious concern" about the growing number of casualties on both sides, including increasing Palestinian civilian deaths in Gaza and the loss of Israeli soldiers, but reaffirmed the U.S. position that Israel has a "right to defend itself." Kerry was on his way to Cairo on Monday to engage with regional leaders gathered there to work on the possibility of a negotiated settlement. Kerry made headlines on Sunday for what were described as "unguarded" comments made to a senior aide in which he was shown expressing frustration over the increasing numbers of civilians deaths caused by Israel's attack. "It's a hell of a pinpoint operation, it's a hell of a pinpoint operation," Kerry said, seeming to challenge the repeated claims made by Israeli officials.